If you recall in my prior post on Process Art with Toddlers I mentioned how much I love an ongoing canvas for toddlers! I started one with Stella this time last year and she continuously adds to it every time that we paint! Today I'm sharing more about our process! We typically paint once a week which I know to some seems daunting, but I promise you, it's really so easy! I think that's the beauty of an evolving canvas and process art! It isn't some pre-planned Pinterest project, but rather a truly organic experience between child and paint! I keep a plastic tub full of cheap acrylic paint from any craft store! It costs 89 cents per tube, so it is insanely affordable!! I also keep foam brushes, natural brushes, plastic pallet knives, a brayer (roller), plastic cars, and a squeegee in the tub as well! This is our basic art kit! I store it in our garage and just grab it when we want to paint which is always done outside! If you haven't read my previous post, an evolving canvas is exactly how it sounds! It is a canvas that is constantly evolving. There isn't a designated end point or overall picture to be achieved! It's like a dry erase board that you never erase! It's great for so many reasons, but my favorite is that it makes painting so much easier as you aren't searching for paper or a new canvas each time. Instead you keep layering on the same canvas, and as the name states, it evolves over time! Stella's evolving canvas has become a shared canvas as many of her friends that have come over have helped her add to it! I love the communal aspect! It's so fun to see her working alongside a friend! Most recently she's been in a pink and purple mood, her favorite colors! You can see the depth of color achieved over time! There have been stages where her canvas has rivaled much of what I see in stores these days! If that happens and you want to stop the piece and display it, do it!! 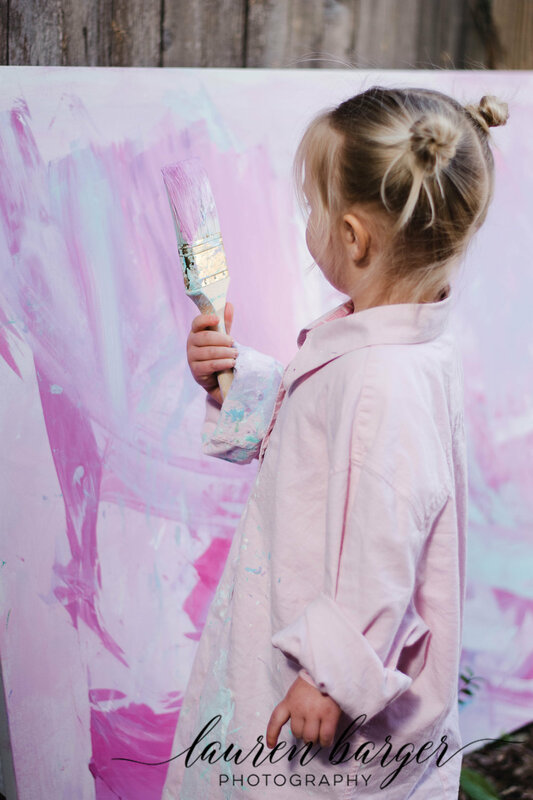 Your child will love seeing their work displayed, and you can always start on a new evolving canvas at any time! If you're interested in process art you should check out my prior posts! It's really a great way to allow your child to interact with art and explore their creativity!! If you and your child try any of the processes, be sure to share it with me! I'd love to see! !